KatandLiz | My life, Movies, Books, Nature, Photography, Advocacy and in Memory of Elizabeth! My life, Movies, Books, Nature, Photography, Advocacy and in Memory of Elizabeth! 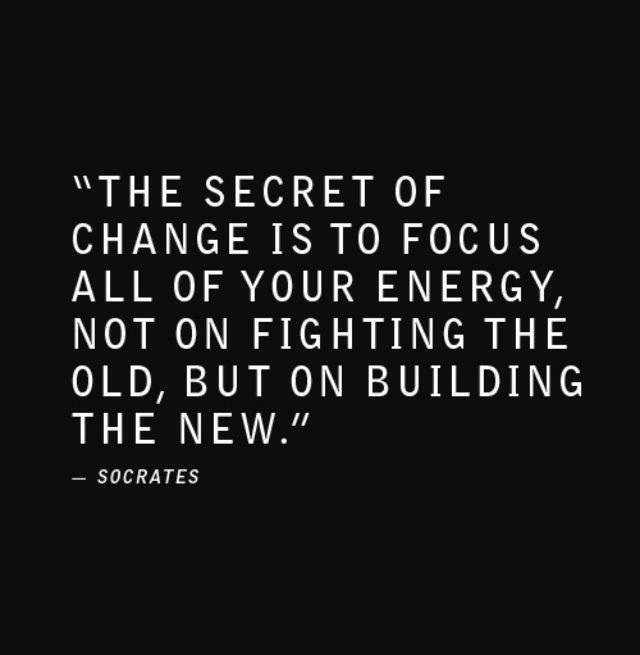 Change is something that I think about all the time. I can barely recognize my life anymore. I’ve experienced loss like I never knew before. I became a mother. I’ve grown professionally. Life is good. It’s just different. I feel like I’ve learned more in the past 3 years than my whole life put together. There is a sense of awareness that I never had before. I’m grateful for that and my experiences have really shaped the person I am today. I don’t think I would change anything if I could. Sometimes things don’t work out the way you want them to. I’ve learned to let go and not fight the universe. I practice this everyday. I try to let go of the fear, anger and everything that holds me back. I’m so grateful for the work I do because it teaches me that kindness is the best medicine. That one person can make an impact. Everyone has a story to tell, just ask them! That no matter how bad you feel about your life, yourself, your situation, it can get a lot worse and that there is someone out there that does have it worse than you do. Hold onto hope and faith and just know that everything is as it should be. Learning that releases you from any kind of power struggle you have with the universe. It is easier to just be. Oscar Night: Quick Best Motion Picture Roundup! Ok, just a quick roundup of the Best Motion Picture Nominees I got to watch. I never got to finish The Theory of Everything and didn’t get to see The Grand Budapest Hotel so those are not included but 6 of our 8 is not bad! I actually really liked this movie. I wish I had read the memoir before the movie but with a 1-year-old baby, 2 dogs and a full-time job #aintnobodygottimeforthat anymore, lol. From a mental health perspective, it was interesting to see him go from being in combat to coming home. I liked the contrasts in that and how difficult the adjustment can be. I would say this is a big contender for Best Motion Picture. Having Clint Eastwood as director doesn’t hurt either. I’m not going to say much about this one because to be completely honest, I could not watch the whole thing, I fell asleep. It was a little slow for me and I just refused to watch something that doesn’t catch my attention in the first few minutes anymore. I know it got great reviews and other people loved it so if you are one of those people, please enlighten me. It’s been an emotional week, Elizabeth crossed the Rainbow Bridge 2/4/13 and I’ve been thinking a lot about her, I miss her dearly, I still get sad. I don’t think that will ever go away. It’s fine, I can sit with the pain and let it be. I understand it too shall pass. 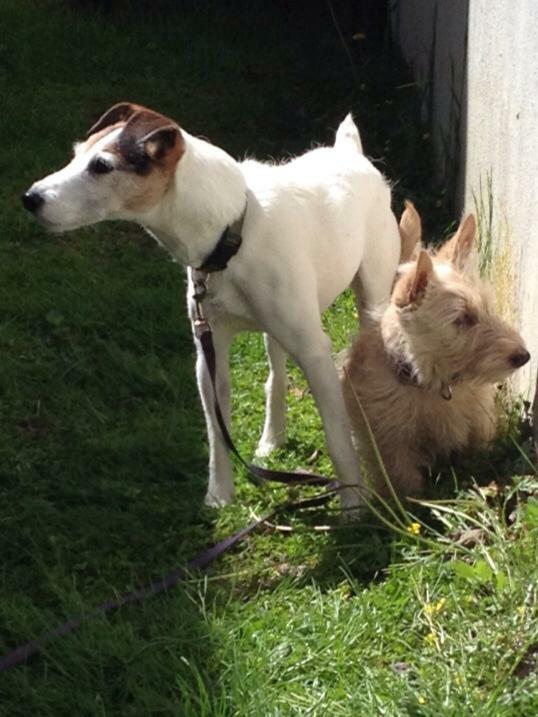 Yesterday I had friends that had to say goodbye to their beloved Scotties and Westie, I feel for them too. It brings it all back for me. Once the sadness is over I can recognize that she’s still here, shes everywhere, in pictures, in our memories, our hearts, that she’s a part of me, I will be with her again. 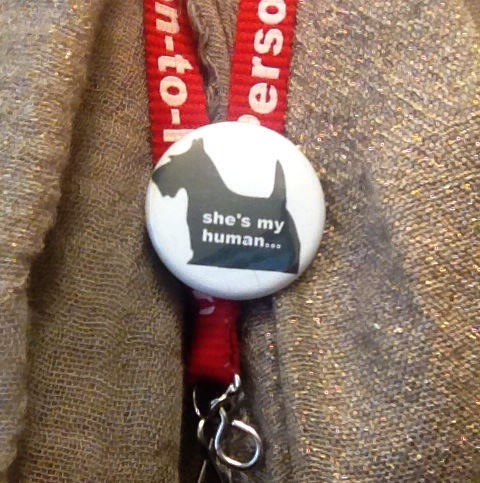 I’ve been wearing this button a dear friend gave me around my name tag at work for a couple of days now and it makes me feel better. I will always be her human. Happy 2nd Birthday Gracie Lou Who! From the day Grace came home, she turned our world upside down! She is a handful. I had completely forgotten what puppy hood was like. Our first dog Snoopy, a JRT or Parson Russell was an insane puppy! He could have a series of books. 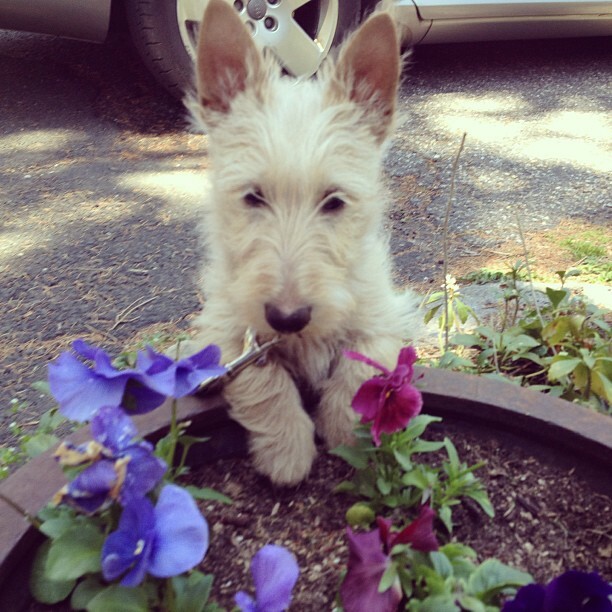 Our 2nd dog but 1st Scottie Elizabeth was an angel puppy, so we weren’t expecting Grace. She eats all kinds of stuff she isn’t supposed to, and when she was a pup that included her own poop! She breaks into toilet paper and baby wipes, she’s accident prone and a very stinky girl. She like to get dirty and matted. She’s a Wheaton Scottie so her light fur shows it. Sometimes I wondered if it was because she is a Wheaton! 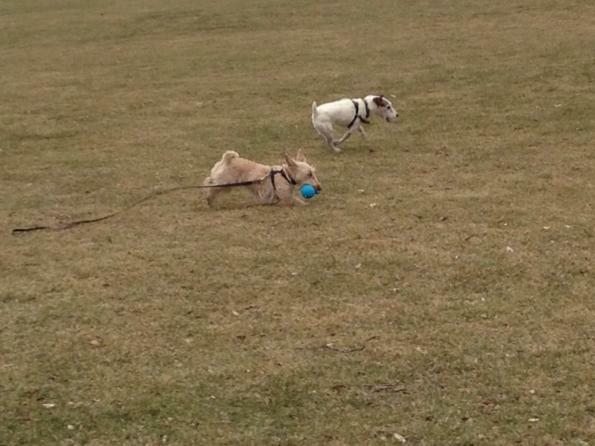 Some days I questioned my decision to get another dog…. But I cant imagine our life without Grace in it! When our daughter was born, I realized that Grace will be there for Kenzi, like Elizabeth was there for me. It makes perfect sense! So here’s to Grace! 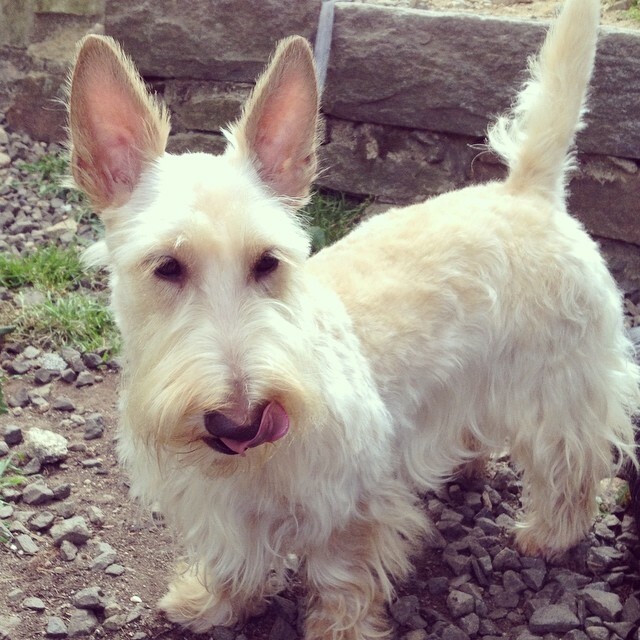 Happy 2nd birthday, we love our Wheatie Scottie girl! Just wanted to say hello from my blog! I feel the need to reinvent this space and write! So I will! I don’t know when I’ll find the time but I will! 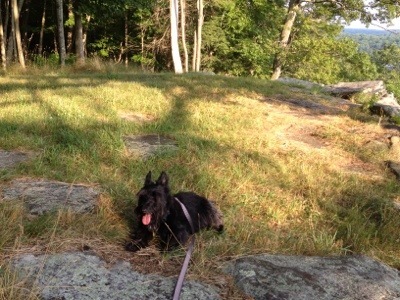 I haven’t posted since March, mainly because after Elizabeth, my precious Scottish Terrier passed, it was hard to write on this platform where I often wrote about our life together. My life has changed so much since! Just like she thought me so much in life, her death thought me a great deal too. It thought be that nothing last forever, everything is temporal. Life is a winding road. It’s where you are now, in that exact moment that matters. Embrace the now and be in the moment, every second, because it will end before you know it. I can barely recognize my life since her death. To catch you up really fast. I got another Scottie. Her name is Grace and she is 6 months old now. Life with Grace is another adventure altogether but she is such a light in our lives. I strongly cling to the believe that everything happens for a reason, that she was meant for us and that we part, to meet again. I will see my Elizabeth again, if there is a heaven, that’s where she will be. 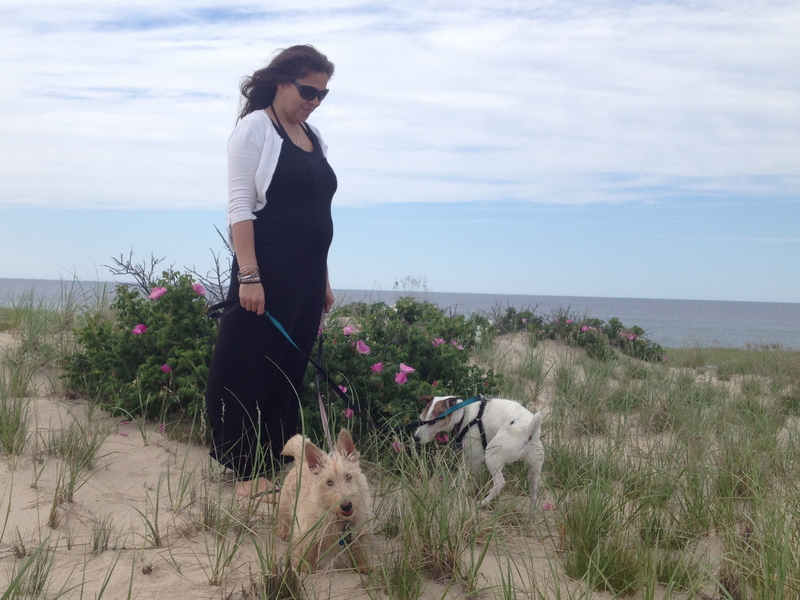 I am also pregnant with my first child. That was a surprise to say the least! Change is eventual but I am so thankful and grateful for this moment. I’m ready to share it with you all! A Prayer for Owen Meany, Simon Birch and a Sunday Rescue Quote! I think about and miss Elizabeth everyday. After Elizabeth passed my paternal grandfather also passed away. My grandfather’s death so soon after Elizabeth was very hard to deal with. It was like I enmeshed the two deaths as one. So it hurt twice as much. My grandfather is one of my only connections to my father, who also passed away. My father’s death, changed the course of my life forever but that’s another story. 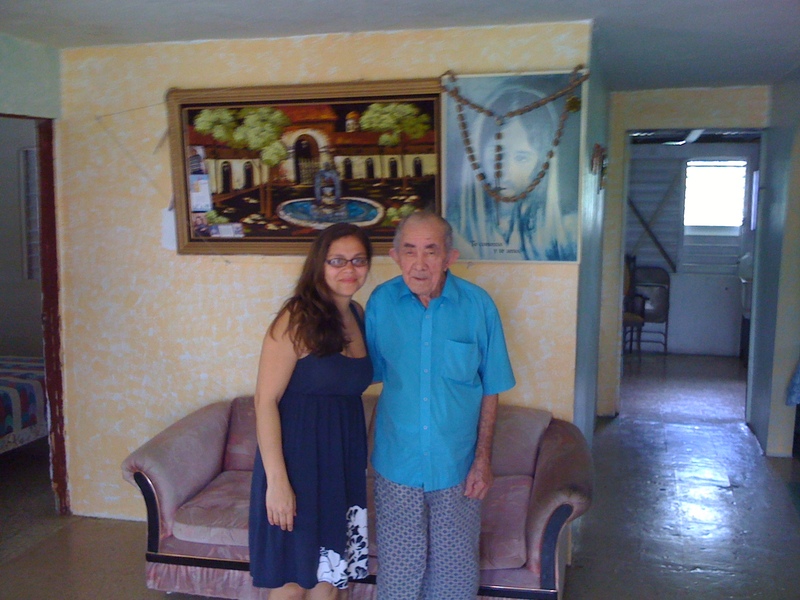 This is the last picture I took with my grandfather, a little over a year ago when I visited in Puerto Rico. He suffered from Alzheimer’s, and everyone said he might not know who I was but he knew. He recognized me instantly and asked for my sister. He then went on to talk about his sons, asking for the ones that were here in the U.S. I try to think about the lessons learned from these experiences. And certain books and movies or little things I hear really get to me. I try to find meaning in everything lately. 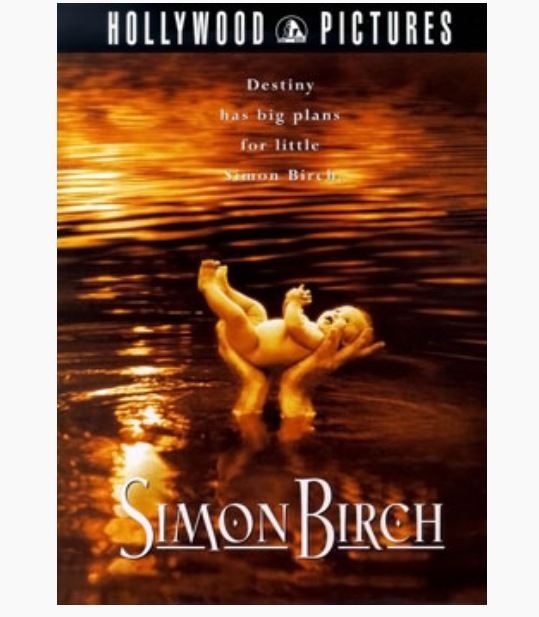 I was watching “Simon Birch” a movie loosely based on John Irving’s “A Prayer for Owen Meany”, some parts were changed and he brokered a deal that the movie could not have the same title. 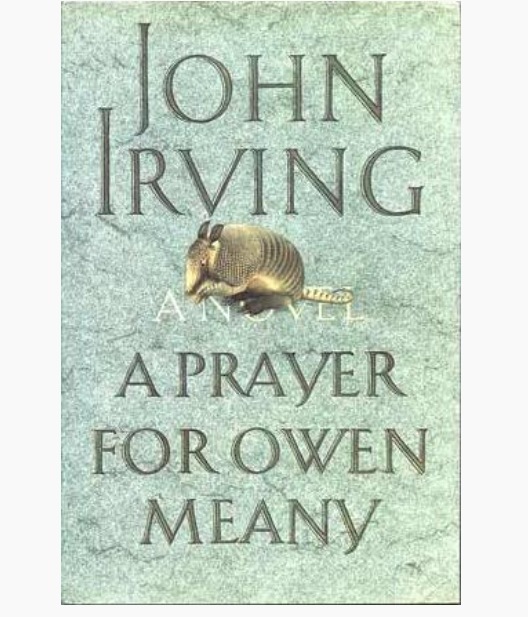 I saw John Irving once, at a reading and he choose an excerpt from “A Prayer for Owen Meany”. I read the book immediately after and it was about faith, about a little boy who believed he was born the way he was for a reason. Recently I was sitting in bed, the movie was on tv and I realize the movie was based on the John Irving book! I’ve been watching this movie since I was much younger but watching it now, its different, I guess because I’m different. It made me stop breathing, I could so relate! He goes on to say the thing he missed most about his mother was her scent and he hated the way it started to disappear.I thought yeah me too. I still try to find Elizabeth’s smell all over the house and I cry when I can’t find it. I think Snoopy our Jack Russell does too. He walks around the house sniffing the floors, the dog beds, her favorite spots. But it also gave me faith! That everything happens for a reason, that there are no accidents, that there is a god and he has a plan, like Simon believes. Simon’s faith is wonderful, something to be envied. That’s the power of writing and storytelling, it can give comfort in pain, make you laugh and cry. I was on a puppy rescue site looking at rescue pups and I came across a paragraph that I’ve been reciting to myself since, I keep thinking this quote is meant to rescue me. just like the Simon Birch quote, It touched me and I don’t have the author’s name to give credit to but I wish I did, because their words gave me comfort and made me think! So thank you unknown author for this! “Life is filled with trials and tribulations, its moments of victory and glory. Neither the ups nor the downs can be avoided no matter how desperately one might try. The best one can do is remember that everything is temporal and whether the situation to be endured is pleasant or unpleasant is inconsequential. Both are fleeting experiences and shall pass with time.